This was the last of my blog entries about my french course that i took, last year. I really wish i had kept up writing as now i find it so interesting to look back on. You store a collection of memories on a blog like no other. Between now and when i stopped blogging i have so many memories that i wished i had written about at the time, the details of which are now fading into the blur which is my past. Well last night before going to bed I remembered I had not done my homework, actually I could not even remember what we were set, and so I did all the questions. I was not going to get caught out for a second day. Today went a little better; I am starting to get to grips with verbs, enough for me to be able to get the right conjugation in front of the class. After a good night sleep, my brain is starting to function again. Yippee. About half the class are so far ahead of me, the other half are about at my level. It’s the last day for about half the class, so next week we will be down to 5, and luckily most of the really good people are off, so the lessons should be much more focused at my level. In the afternoon i went back to the park for more studying, but today i remembered to bring my camera. I have managed nearly a week in Nice, and only have only taken a handful of pictures, hence some of the poor quality photos. So back up to the châteaux for some more great views of Nice. 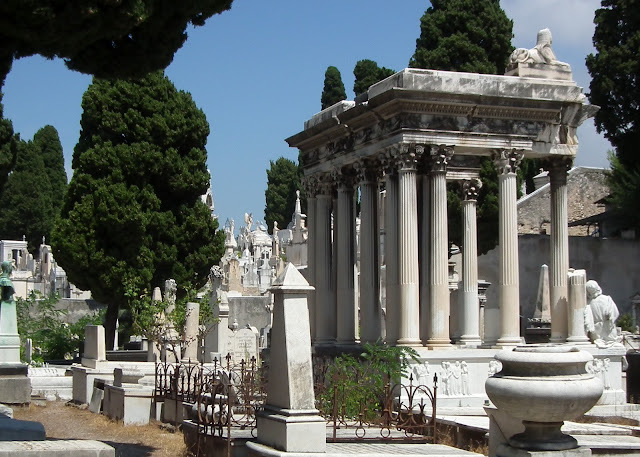 I visited the Cimetière Colline du Château, which was amazing, there was no photography allowed in the cemetery, so i went next door and took photos in the cimetiere israelite (where i could not see an anti-photo sign). The cemetery is full of amazing statues and tombs, that you just don't find in the UK. The cemetery's are so beautiful and well kept and yet i saw know body else, which makes me wonder why? Its defiantly worth a visit if you want to get away from the hustle of the rest of the French Riviera. It’s so hot today, I have just nearly about melted at the park. My walk back to the tram has taken me about two hours; I just kept stopping for ice-cream and cold drinks. So it getting late now and it seems like I have done nothing with my day. Apart form studying I am just seem to chat and chill with people in my dorm. Traveling and Crochet - My Little Etsy Shop.